Every victory - regardless of how big or small - remains a victory and should be celebrated. Last week I wrote in my weekly newsletter that I had been staring at the same problem for too long and that the focus on always keeping the bigger picture in focus had left me feeling jaded. So to counter this, I decided to instead focus on celebrating a minor victory. On Wednesday last week, I found that inspiration suddenly hit and within 4 hours I had rolled out a completed, self-contained project: Unstartup. And in doing so, I wanted to build an audience. One of the things that I have been spending a lot of time on recent months is to produce great content here and use that as the primary channel to drive signups to my mailing list (something which I regret not doing sooner). Unstartup just seemed to fit perfectly with those goals, as I would be teaching & sharing some of the experience and knowledge I had built up over the years. Beyond that, it would also appeal to the audience that I am hoping to help (and eventually sell to): entrepreneurs. In the rest of this article, I'm going to share the details of how I accomplished this and also what the results have been in the first week. Outlining the basics of the content that I needed to produce. 15 mins. Drafting the introduction e-mail, along with the first two weeks' educational content (two further e-mails). 2 hours. Designing and building the website. 1 hour. Implementing CampaignMonitor and Google Analytics. 15 minutes. Drafting the third week's educational content. 30 minutes. That's 3064 words in about 2:30 hours, which is consistent with my ability to produce about 1000 (edited & researched) words per hour. The reason I only did the first 3 weeks' content, was because that'd give me enough of a headstart before I'd need to produce content again. What I'm doing now is to produce one or two weeks' content every week and I've just made this writing part of my weekly writing schedule. I'm not the world's best designer or developer, so I focused on keeping things incredibly simple for the website. For the design I kept things very minimal and flat, whilst I used a $15 stock vector image to add a splash of decoration. And the coding is all static HTML & CSS that I just included in a basic WordPress template (because I have a free account from the awesome guys over at WP Engine). Create a new Subscription list specifically for Unstartup. Integrate the HTML form code into my website / WordPress template. Set up an auto-responder e-mail course, which functions exactly like a drip campaign. I didn't want to launch Unstartup blind and I always intended to (hopefully) write this article to share my experiences, which meant having data on hand was a big requirement. What percentage of users that got to the page signed up to the e-mail course? The Segment.io WordPress plugin does something cool out-of-box in that it tracks a visit to every page as a separate event. So to calculate the conversion metric above, I only have to divide the amount of visits to the Thank You page (which you get to after signing up) and visits to the Homepage. I tried various angles to promote / mention Unstartup in my tweets and you can see that the first tweet got by far the best traction. But let's get to the best part then... How many signups has Unstartup gotten in the last 7 days? That conversion rate on a MVP, untested landing page is absolutely incredible (even I was surprised). Consider also that I have captured the attention of 319 new people (via e-mail, which is one of the best engagement mediums) and all of the initial e-mails have had an almost 60% open rate (which too is great considering industry standards of about 25%). It was great to be able to work on something for 4 hours and almost instantly kickstart a positive feedback loop. This was also a great diversion from tackling the bigger picture challenges I've been having with PublicBeta and when I went back to those on Thursday, I felt refreshed. Teaching and sharing your experience is always valuable. People love and appreciate this. It's amazing how much you can do using WordPress as a MVP. When launching some speculative like this, it's important to limit your time and validate that there is at least some kind of interest. WordPress enabled me to spend only 1:15 hours on the technical bits. This is proof of how much you can achieve with only 4 hours of undistracted and effective work (I did shut off all e-mail and social media, as I did now when writing this article). Yes, I still have work left, but the reward / return until now far exceeds the 4 hour investment of my time. 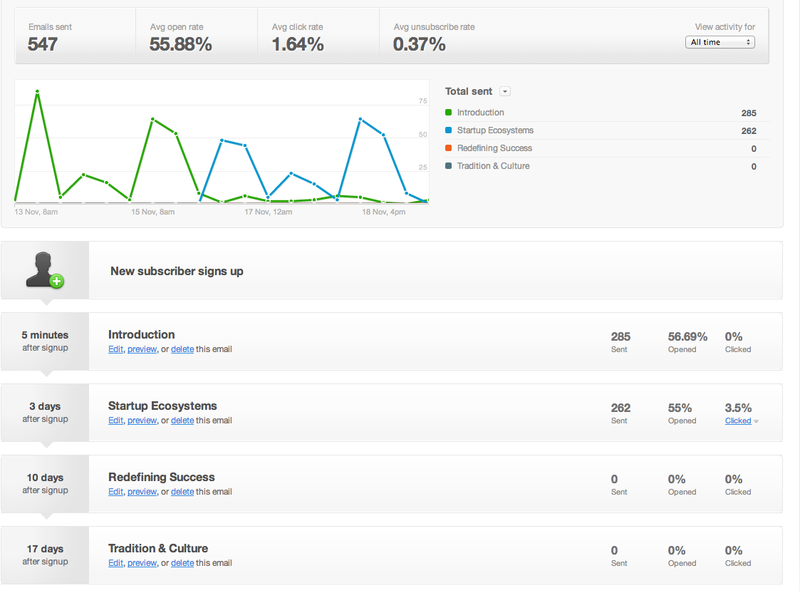 Unstartup is now an asset to me and forms part of my long tail strategy to build an audience of like-minded entrepreneurs. Since the initial burst of signups last week, there's been 10 - 20 new signups every day without me having to do anything about it. That should continue indefinitely now.